Henry Townsend has had some time to perfect his craft. The 92-year-old elder-statesman of blues recordings has decided that what works best for him - what evokes the most emotion of true blues from his fingers and voice - is to wing it. Now, let's be certain, it takes immense talent to pull off effective improvisition. Townsend's tunes, while generally rehearsed, are anything but simple. 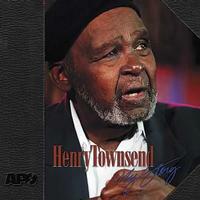 With My Story, Townsend has put out records in every decade since the 1920s, a feat no other musician can claim. Still, he hasn't been able to come up with an explanation of where his on-the-spot originals come from. "I just don't know," Townsend said to a television reporter who asked him to explain that intangible during this recording session. "You're asking me a question I can't answer." For this recording Townsend sat perched over the piano or cradling a guitar in his lap, and simply verbalized to music the happy or sad thoughts that crept into his mind. As the songs took firm, and with tape rolling the whole time, he'd invent new lyrics and verses. The accompanying musicians - Sho Komiya on bass and Townsend's long time partner Ron Edwards on guitar - could not anticipate. Playing with Townsend requires a sympathetic ear and quick adjustment. The songs that stuck to this record are nothing short of genius with rough edges. It's Townsend's choice of timeless topics that keeps each song fresh. Since running away from his native Mississippi at the age of 9, Townsend has been playing guitar and piano on the St. Louis scene. His most famous musical pairings were extended gigs with Roosevelt Sykes and later with Walter Davis. Townsend is also one of the few surviving musicians to have played with Robert Johnson. The 1999 book, A Blues Life, chronicles his vast experiences. My Story should serve most aptly as the audio documentation of this legendary life. Just as it is a general practice of the wise to heed the suggestions of their respected elders, so goes with My Story. A lot can be learned here, if only the lesson of what an exposed soul sounds like. "Robust piano notes, occasional guitar licks and a thoughtful and carefully executed vocal line works through these timeless laments and universal tales of loneliness, lost love and rural poverty which have been a staple diet for blues men since Henry began recording back in the twenties. Themes that were so innovative all those years ago still prickle with gritty and irreplaceable observations...It proves that Townsend is no dinosaur."